Check out the latest and greatest Health Wonk Review Election Edition – Mama Says Eat Your Peas and Don’t Forget to Vote. Peggy Salvatore hosts this pre-election edition at Health System Ed blog and while there are several posts related to policy issues are play in the election, there are several other posts too – check it out! And while on the topic of elections, marijuana legalization is on the ballot in 5 states this election. The states are populous enough that if all were to be approved, the laws would encompass about one quarter of the US population – critical mass for federal legislation? There are also four states with ballot measures to approve medical marijuana. Russell Berman writes about all this in the Atlantic: Marijuana’s Moment. Must-read: If you haven’t yet read Joe Paduda’s 2-part series on customer service in workers comp, you need to go there now. In part 1, he makes the case that case that customer service functions must be handled internally; in part 2, he offers a case study demonstrating that it’s not about your company’s metrics, cost structure, or “efficiency”, it’s ALL about your customer. Opiod News from a recent KHN Morning Briefing: The pharmaceutical industry has taken to treating secondary symptoms of opioid abuse with more pills. Meanwhile, even as the U.S. tries to regulate the trade of chemicals used to make fentanyl, a new, extremely potent drug is hitting the streets. Is the Gig Economy Shifting Gears? Do you have the right fire extinguisher for your workplace? Are You Liable for Your Temp’s Safety? We’re looking forward to the workers’ comp age of the cyborgs and it looks as though we are getting closer. 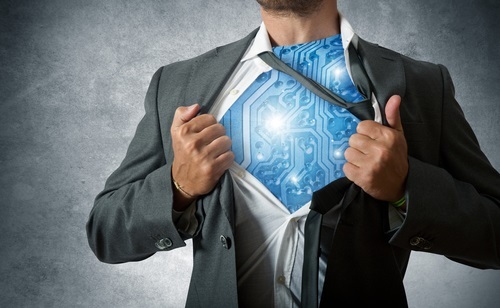 We are happy to see Roberto Ceniceros championing some exciting mobility technologies in his recent column at Risk & Insurance: The Case for Exoskeletons. He talks about how they are helping some patients with spinal cord injuries to stand up and walk. “Exoskeletons are assistive devices often described as “wearable robots” or “Segways with legs.” Since 2014, the Food and Drug Administration has approved two models for personal use, including one earlier this year. Some workers’ comp insurers have already approved a few claims for the motorized devices and the cost of training. Other underwriters have declined to fund them. An accompanying article – The New Normal by Susannah Levine – talks more about how advanced care techniques and technologies are helping workers with brain and spinal cord injuries get back to living full lives. She interviews several people who work with catastrophically injured workers talk about what they are seeing in the field. “Toyota announced this year that it’s bankrolling a reboot of the iBOT, which the machine’s inventor, Dean Kamen, says will allow him to make some improvements. “With advances in computers, the advances in solid-state gyros and electronics … we can take a hundred pounds out of it. We can take a lot of cost out of it. We can improve it,” he told NPR. The story also interviews Gary Linfoot, a former Army helicopter pilot, who talks about how the iBOT changed his life. We’ve been posting about mobility devices and assistive technologies over the years – see Make way for the cyborgs: robotic mobility devices. We’re excitied to see the renewed interest in iBOTs and the progress of other devices that help the disabled and the injured lead more functional lives. Bring on the cyborgs! A fresh Health Wonk Review was posted at the tail end of last week – Pre-election Pundit Ponderings. Joe Paduda is the host at Managed Care Matters. It covers a wide range of topics, including various aspects of the ACA, the exchanges, Medicare expansion, pharma costs, and more. 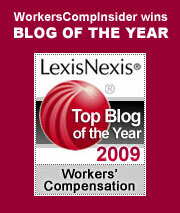 Plus Joe points to a new workers comp blog: Good News Work Comp Blog. I have always tried to surround myself with people smarter than I. People such as Gary Anderberg, Peter Rousmaniere, Jennifer Christian, Joe Paduda, Bob Wilson, Mark Walls and Julie Ferguson, to name just a few of the legion. Mike Manley is in the group, too. Mike is Research Coordinator for the Oregon Department of Consumer and Business Services and co-author of what is known in the biz as The Oregon Study. For three decades, the state of Oregon’s workers’ compensation research group has published this bi-annual study, which won the 2006 IAIABC Research Award. The executive summary of this year’s study is due to be released in the next few days, and the findings are closely watched in quite a few states. Unlike the National Academy of Social Insurance report, issued last week, the Oregon study takes the comparison beyond simple averages. Instead, Oregon derives average rates for what a hypothetical set of comparable employers would pay, thus factoring out much of the difference in states’ risk profiles. With any comparison across states in the workers’ compensation arena, there are caveats and fine points to be considered. Naturally, there are questions that arise about the methods and interpretation of the findings. At the Insider, it’s unusual to have guest bloggers; we’ve only done it a handful of times over 14 years. But for important issues, we make exceptions. The Oregon Study is such an issue. So, I asked Mike if he would write something he wanted our readers to know about the upcoming study. He came up with a list of ten, and we’re going to publish every one of them right here right now. Who knows? You may be reading the latest study tomorrow, but if you are, you’ll be armed with Mike’s intelligent cheat sheet. What follows are the ten things to know about the Oregon Study, by Mike Manley. This isn’t a report card! The study isn’t an overall evaluation of states’ workers’ compensation systems. There are other important aspects of workers’ compensation systems that are beyond the scope of this analysis. The study focuses on one aspect of workers’ compensation systems: rates paid by employers that purchase insurance. The study uses a consistent hazard mix across states. This is done by giving each state the same hypothetical distribution of risks, in order to control for the differences in risk across states. This distribution is most similar to Oregon (a national distribution doesn’t exist). Occasionally there have been concerns that this might create some kind of bias, so we’ve checked into that question. Looking at other methods that don’t use the Oregon risk distribution to standardize risk, we find no basis for this concern. The other studies have results that are very similar, once a consistent hazard mix is used. Rank values are useful, but they have major limitations for interstate comparison. So, we publish a second comparison factor, Percent of Study Median. We recommend using this measure, rather than rank values, for comparing states’ relative rate position over multiple studies. We study rates using a snapshot on January 1 of the study year. We look at where the rates are on the date of the snapshot, not whether they are going up or down. Index Rates are averages, sort of. The study’s Index Rate is different than a simple average rate. Premium rates within a state vary dramatically by the risk classification involved, and states’ economies have a different mix of these classifications. The study controls for these differences by looking at premium rates as if each state had the same mix of risks. This figure is the Index Rate, which is not the state’s actual average; instead it’s an average that has been weighted for comparability across states. High-wage or low-wage state? Don’t worry, wage rate differences across states have little or no impact on the results. Here’s why: rates in workers’ compensation are measured in dollars per $100 units of payroll. High-wage states may have higher benefit levels, but they also have higher wage bases. So, when both parts of the computation increase with higher wages, the resulting rate isn’t affected. Pure premium rates are a big part of the rate comparison, but only a part. The study also includes factors for insurer overhead and state administrative agencies’ assessments, when these can be put on a comparable basis. Study data don’t tell us why a state’s rates have been going up or down, or where they might be in the future. Nor do they tell us how effective a system is in minimizing disputes, getting injured workers back to work, paying out adequate benefits, or getting cost-effective medical treatment. Clearly, those are important performance areas too. The study doesn’t consider insurers’ profitability, discounts, dividends, or activity in the state’s assigned-risk plan. Those items aren’t available for all states, and even when they are available, they’re often incomplete during the year we’re studying. Employers that self-insure (or, in a few jurisdictions, opt not to insure) aren’t included in the study because they aren’t paying workers’ compensation premiums. a full report with much greater detail, published the following winter. With about a month to go until the election, we’re offering a guide to where the Presidential candidates stand on key workplace issues – in their words and in the view of various experts. If you haven’t yet registered to vote, voter registration deadlines (calendar) are upon us now! Politics in the Workplace: What Must Employers Allow? Trump will be GREAT for workers’ comp!